When the Gas Module™ is connected to the H-Cube Pro™, it allows the introduction of other gas than hydrogen, such as carbon monoxide, oxygen or Syngas. The user can choose from 14 gases to be used at up to 100 bar using the touch screen control of the H-Cube Pro™. The Phoenix Flow Reactor™ is a powerful instrument which can be heated up to 450 °C and is compatible with multiple types and sizes of reaction zones (CatCarts®, MidiCarts™, coils, metal-metal sealed catalyst columns). When one or more Gas Modules™ are connected with the Phoenix Flow Reactor™, it is possible to set up a system to perform catalytic gas reactions with one or more gases. For gas-liquid catalytic reactions in the Phoenix Flow Reactor™, the Gas Module™, with the aid of a gas-liquid mixer, introduces the gas into the flowing reactant solution moved by an HPLC pump in the form of a flow of microscopic bubbles. Then, this gas-starting material solution will enter the reaction zone. It is also possible to have the widest chemistry space by connecting the H-Cube Pro™, the Phoenix Flow Reactor™ and the Gas Module™. All three devices can be controlled with the touch screen of the H-Cube Pro™, resulting in a system capable of handling more than 14 gases (one at a time) with up to two reaction zones: the one from the Phoenix Flow Reactor™ and the CatCart® holder from the H-Cube Pro™, capable of working between 10 °C and 150 °C, between atmospheric pressure and 100 bar. What instruments can be used with the Gas Module™? You can connect the Gas Module™ to the H-Cube Pro™ and to the Phoenix Flow Reactor™ or use it with the automated system. Can the hydrogen generated by the H-Cube Pro™ be used when utilizing the Gas Module™? No. For safety reasons, when the Gas Module™ is connected to the H-Cube Pro™, its software automatically blocks the generation of hydrogen. Does the Gas Module™ generate the 14 gases itself? No. The Gas Module™ actually does not generate any gases, it only regulates the amount of gas coming from a cylinder. How many gases can be introduced into the system at one time? Only one cylinder can be used at a time, so the amount of gases depends on the gas type in the cylinder: only gas mixtures such as SynGas can be introduced. At what pressures can I use each gas? Only gases can be introduced into the Gas Module™. To avoid any condensation, you have to make sure the pressure you are using is under the vapor pressure of the gas. Reaction pressure has to be at least 15 bar lower than the pressure of the tank. The vapor pressure of each gas is given in the below table. What is the maximum amount of gas that can be introduced? How is the gas pressure generated? The Gas Module™ does not have a compressor. Please ensure the gas source is able to maintain the pressure above the inlet pressure of the H-Cube Pro™ or the Phoenix Flow Reactor™ during the reaction. The reaction pressure is set on H-Cube Pro™ or on the Pressure Module connected to the Phoenix Flow Reactor™, between atmospheric pressure and 100 bar. The gas cylinder pressure must be at least 25 bar higher then the inlet pressure of the reactor. Can I use cylinder with dip tube installed? No. 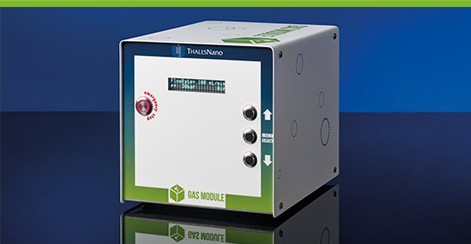 Only dry gases can be introduced into the Gas Module™. The use of wet gases is not allowed. Do I need any upgrade on the H-Cube Pro™ to be able to connect it with the Gas Module™? No. The H-Cube Pro™ is equipped with all the software and hardware tools to be connected to the Gas Module™ and being able to control it. What else do I need to use the Gas Module™ with the H-Cube Pro™? You will need a gas source (typically a cylinder) with a high pressure regulator attached. The external fitting should be able to connect to a 1/8 stainless steel tube. What is the maximum pressure can be set on the gas source without damaging the Gas Module™? A maximum of 140 bar should be applied. What regulators can be used which are compatible with the Gas Module™?